Simonstown village is situated on the west coast of False Bay starting with its southern end at the Boulders ending near Glencairn in the north. Our visit to Simonstown starts at the Boulders where there is a beach with a number of large granite boulders. On the slopes above the beach are a number of houses and nearby is a golf course. There is also a nice restaurant and these days we have the Boulders penguin colony as well. The Boulders is a lovely safe beach and good for swimming. It is at this beach in 1983 that two penguins came ashore at Foxy beach between the boulders and decided to stay. They started nesting on the beach and in 1985 laid there first eggs. Since then the penguin colony has grown quickly and increases by 60% per annum. By the end of 1997 there were 2350 adult birds in the colony. As the colony grew the birds spread out into the residential area nearby and caused damage to people’s gardens and also made a lot of noise. After numerous complaints by residents it was decided to build a walkway and to fence the penguins off on the sea side of it. The reason for the concern over the birds is that it was the first land based colony of penguins on the South African coastline. With the birds fenced off they were also being protected from dogs and cats that attacked them and it gave them an area where they could breed without being disturbed. Today this colony has become a major tourist attraction with thousands of people visiting them on a daily basis. Because there are wooden boardwalks into the penguin reserve people can see and study them without disturbibg them and life goes on as normal in the colony. The penguins breed from February to August. In September they go to sea to fatten up for the moulting season which starts in November. 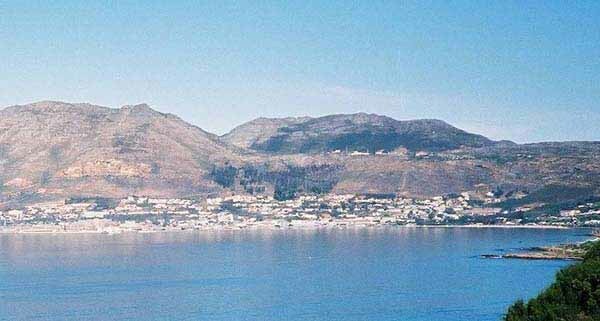 Continuing northwards we drive into the Simonstown village, which derived its name from Simons Bay. Simons Bay received its name from Simon van der Stel who was one of the Dutch governors of the Cape. 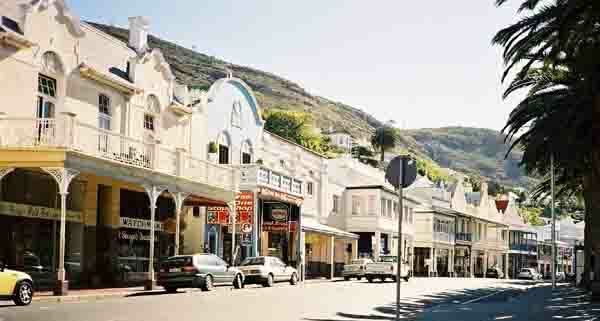 Building in Simonstown was started in 1687 and the town grew steadily. In 1743 a port was established and the town and the port were taken over by the Royal Navy in 1814 when the Dutch were removed from power in the Cape. The port was finally returned to South African Navy in 1957 when the British Navy left. Today the port has been renovated and is home to a number of navy ships including submarines. St Georges Street, the main street through the town has twenty-one buildings which are over 150 years old. Today there many small shops and pubs to explore along it’s entire length. A museum displaying the history of the town opens daily and can be found in the main street. 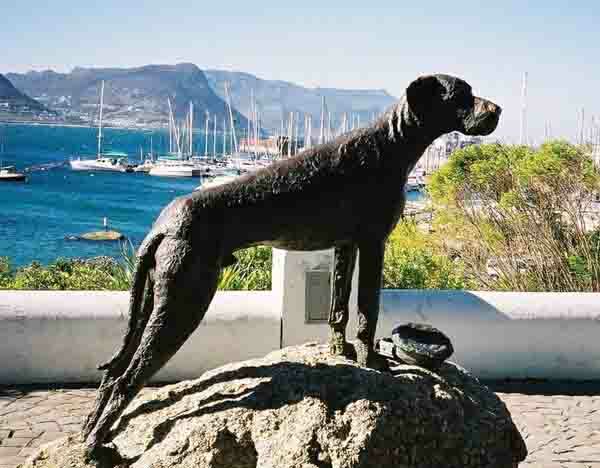 On Jubilee Square there is a statue of Just Nuisance a Great Dane who befriended the sailors stationed at Simonstown during the war years. Somehow he recognized the uniforms of the sailors and was every sailor's friend. He did not care much for other service people. Just Nuisance was a very clever dog and caught the train to Cape Town each day and accompanied the drunken sailors home after a night out on the town. He knew each station between Cape Town and Simonstown and was often thrown off the train by railway personnel. This did not phase him and he would either wait for the next train or walk to the next station and board the next train there. The railways took exception to this and threatened to have him destroyed if his owner a Mr Chaney did not control him. After many letters of complaint to his owner and no solution to the problem the Navy decided to adopt him. He was enlisted as Able Seaman “AB Just Nuisance” on the 25th August 1939 and with this enlistment came all the perks that normal sailors got including a train ticket. Just Nuisance often went AWOL and found his way to Wingfield AirBase near Goodwood about 40 kilometres from Simonstown where he was smuggled onto planes by pilots flying patrols in search of enemy submarines. During 1944 Just Nuisance started to go lame from a thrombosis caused by a motor accident. It was decided to have him put to sleep and this was done on his 7th birthday the 1st of April 1944. He was buried on the 2nd of April with full military honours including a firing party and a lone bugler. He is buried in the Klawer camp at the Navy’s signal school. His grave is marked by a granite gravestone and can still be seen today. Between June and November four species of whale visit False Bay and can be seen close inshore. They are the Southern Right, Brydes Whales, Hump back and the Orca. The Southern Right being the most common visitor to our shores. Simonstown is built at the base of a hill and looking down from the top there are some fantastic views over the harbour and town. A view not to be missed! The hills above the town form part of the Table Mountain mountain range and contain much of the flora and fauna that is found all over the Cape Peninsula. Being part of the Table mountain range which is made up of sandstone one will find many sandstone formations near the town. Part of the bay where the regattas are held. During the summer months the navy arranges regattas in the bay and pits its sailors against all comers. The coastline along this part of the Peninsula has many secluded beaches which are a draw card for sun lovers. A fitting climax to a day out in Simonstown is to take the train from Simonstown to Cape Town following in the footprints of Just Nuisance. The train line hugs the coastline just metres above the sea all the way to Muizenberg. On a day when the sea is rough this can be quite daunting as the waves roll in and send spray flying high over the train as it passes by. The quaint village of Simonstown is well worth a visit and is on the route of our Peninsula tours which you can enquire about below.